Last year I wrote the March 2011 To Do list and there was snow on the ground. This year? Yeah…you guessed it! But, hey, ignore the snow dusting the ground right now – the fact is, March is here, spring is coming and we gardeners can feel it. Here’s what Maritime Northwest gardeners should be doing this month. If you want to plan with the big picture in mind, download the Year Round Vegetable Planting Guide for free in the Downloadables section. If you haven’t ordered your seed potatoes yet, don’t delay – local potato specialist Irish Eyes Garden Seed is already out of many popular varieties. If you are new to starting your own seeds you might want to check out my three-part Seed Starting 101 series: Key Components For Healthy Seedlings, A Step-by-Step Visual Guide To Growing Seedlings At Home, and Up-Potting. Tomatoes – unless you have some crazy plan for extra early tomatoes involving corrugated metal roofing as sun reflectors, late February or early March is a great time to start tomatoes indoors. Peppers & Eggplant – these are more tender than tomatoes, so standard practice is to start them a few weeks after tomatoes. I find it’s just easier to start them at the same time and up-pot them in a gallon pot so they have the longest grow time. Peppers grow slow. Remember to use cool-climate cultivars. Like tomatoes, small peppers will tend to ripen more reliably than big ones. Treat Eggplant like really tender peppers and baby it with the warmest, sunniest, most protected spot you can. Brassicas – broccoli, brussels sprouts, cabbage, cauliflower & kholrabi can all be sown under light lights early this month, or wait until after mid-month and sow outside under a cloche. If you’re going to sow out, make sure your cloche is in place a few weeks before you plan to sow so the soil can warm and dry out somewhat. Hardy Herbs – Parsley, chives, fennel, chervil, oregano, dill, mint, sorrel, marjoram, lemon balm, pansies etc. can be started under lights. Salad Greens – Sow more salad greens! Outside, your seeds will take quite awhile to germinate with soil temps this low. Spinach – Just like the other salad greens: new month, more spinach. Kale & Collards – They are very hardy and can be started in at the beginning of the month and transplanted out while still small towards the end of the month quite happily. You can also seed them directly. They’ll take a bit longer to germinate but they’ll grow. I grow kale year round but if you don’t love it as I do, hold off and grow it as a fall crop. Swiss Chard – Start now, or sow outside to a cloche after mid-March. Onions & Leeks – Give them a shot from seed if you want, but I bought plants from Dixondale. As long as the ground isn’t frozen or waterlogged, bare root or potted fruiting trees, bushes and perennials can be planted out. The sooner you can get them in the better. Bare root fruit trees – these should be put into previously prepared ground while still dormant. Bare root fruit bushes (currants, gooseberries, blueberries, etc.). Bare root cane fruits (blackberries, raspberries, etc.). Asparagus crowns – these can be purchased at a good nursery. Look for an all male variety. Rhubarb crowns – these can be had by dividing established plants or purchased at a good nursery. Horseradish roots – these can be invasive! It’s a good idea to plant them in a very large container sunk into the ground to control their roaming. Remember that any veggie sown or transplanted out in March will be happier and give better results under a vented cloche kept in place through May. Make sure to prevent heat build-up by venting during the day, especially if it’s sunny! Also keep the ground moist enough to assist germination. 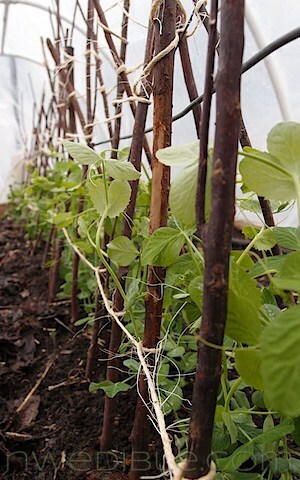 Peas & Favas – This year the ground feels warm enough to sow peas out directly at any point. I transplanted my peas last weekend (picture above) and will be sowing more out directly in a few days. Salad Greens – Spinach, mustards, arugula, Asian greens and cress can be sown directly for baby salad greens. They all will want to bolt the moment the sun starts showing some real strength so when you see something harvestable, use it. Those greens you started last month under lights are ready to transplant out. Harden them off before you settle them into their outside bed. Carrots, Parsnips & Root Parsley – If you have fine, loose, sandy soil they will probably do fine sown about mid-month. If your ground is heavier and holds water I’d wait several weeks until it’s drier and you can rake it out to a nice fluffy consistency without clods. Radishes – Can be sown out directly. It works well to intercrop radishes and carrots or parsnips. Turnips & Rutabagas – I don’t bother with rutabagas in spring. For me they are a purely fall-winter crop. Spring turnips are lovely though. Harvest them little before maggots tunnel through them. Beets – Can be sown out directly towards the end of the month. Onion Sets – For early green onions, you can plant sets now and use them before they bulb. Potatoes – the gardener tradition is to sow potatoes on St. Patrick’s day (March 17th). But really they can go in anytime from mid March to early June, depending on when you want to harvest them and if they are early season or late season varieties. Avoid a situation where the green growth of your potatoes might get killed back by frost – even though the potato won’t die, it will use a lot of it’s energy up rebuilding green leaf mass and won’t produce as nice a harvest later. The goal of almost any vegetable that’s survived an entire growing season and gone through winter at this point is to make seed as soon as is reasonable. March is the last month you should expect to be able to harvest from your 2011 crops, as the longer, warmer days of April will send pretty much everything to bolt. If your cole crops make flowers and you can possibly leave them in the ground, please do so – bees and other beneficial pollinators love the simple yellow brassica flowers and will swarm to them on warmish days when little else is in bloom. Let those brassicas go to seed and, as a bonus, you may get some tasty mystery-kale-type self-sown starts popping up around your yard. I grew a whole bed of tasty self sown Russian Red (ish) kale last year that way, and gave another bed worth of starts to my neighbor. Beets – any remaining beets should be used before they go to seed next month. My last picking was already starting to taste just a hint metallic. Brassicas – Brussels sprouts and any remaining overwintering cabbage should be used soon – any remaining sprouts should be picked this month. Sprouting broccoli and overwintering cauliflower should be ready this month and, depending on variety, into next. Carrots & Parsnips – finish off the overwintered carrots & parsnips, they’ll go to seed soon. Kale & Collards – if your kale is sprouting, the shoots are delicious used like broccoli. Cauliflower – I have two heads of over-wintering Cauliflower almost ready and four more in line behind those. Sprouting Broccoli – sprouting purple should be ready to harvest this month and possibly into April. Mine is just forming side shoots now. Chard – if any Swiss Chard has overwintered, it will be re-growing now and can be harvested. By bed is in ok shape this year. Leeks – Still quite harvestable. Next month leeks will probably send up a seed stalk. If this happens, check the flavor and texture before consigning them to compost. I have harvested leek scapes that were sweet, mild and crunchy. I wish I had grown leeks last year! Turnips & Rutabagas – harvest the last of the turnips and rutabagas; leave them into April and they’ll probably run to seed. Rutabaga-Cauliflower puree is a great option at this time of year. Salad Greens – The greenhouse lettuce has been harvested twice and the mustard greens are just about ready to harvest. Jerusalem Artichokes – I may have actually eradicated Jerusalem Artichokes from my yard. But I doubt it. Stored Potatoes – our second-attempt potatoes stored in-ground with no issues at all. But we’ve eaten them all. I even bought taters at the Yuppie-Hippie market last night. Stored Winter Squash – the squash is still in good shape. I hate to sound like a total garden snob, but e aren’t going through the local-farmer-pumpkin-patch squash at quite the rate we go through the homegrown stuff. The flavor just isn’t as impressive. Still, with enough curry and ginger, even just-okay quash makes a great soup. Rhubarb-is your rhubarb coming up yet? I’m not seeing any growth from mine yet. I’m starting a little earlier than this since I’m in the southeast, but I’m really jealous of all the things you have going on in your winter garden. I didn’t really get much of anything going last fall other than a bed of lettuce, so I’m mostly staring forlorn at my bare garden waiting for life! Erica – I use water teepees, also known as “Wall-of-Water”, to get an early jump on the tomato growing season. I’ve been using them for years and am able to harvest tomatoes 2 – 3 weeks earlier than my neighbors. Have you ever tried them in your area? I just blogged an inventory of urban garden signs of spring but yours is better. The first week of March is my target for starting tomatoes, am I ever ready. The trees are trimmed, mason bees in the crisper waiting for those trees to blossom, salad starts in peat (wishing I would please feed them just a little). It has been too cold here to stand outside and mix the muck for the soil blocker, even on sunny days. I will wait a month to start my peppers and egg plant. Hoping for a mini soil blocker for my birthday to get onions going and new starts for mixed salad boxes that I want to give away. Debs in Everett, WA ……loving this blog! Thank you! This is super helpful. I want to buy your ebook, but I just started my no spend month, so alas. This is amazingly helpful and yet it gives me plenty to think about for the future. I don’t have quite as much going on in my garden, but just knowing all these things I *could* be doing makes me dream about adding on to my garden. Thanks! Yes! Rhubarb round red leaf balls starting to push their way thru! Also very happy to see chives taking off. Thank you so much for your info. I live on the Oregon Coast and it’s nice to be able to come to your blog and get an idea of what to start when. Again, Thank you for taking the time to share your information. Your very inspirational!